Electrical characteristics of amorphous In-Ga-Zn-O (a-IGZO) thin-film transistors (TFTs) are compared by using O2 plasma-enhanced atomic layer deposition Al2O3 dielectrics at different temperatures. High-performance a-IGZO TFTs are demonstrated successfully with an Al2O3 dielectric deposited at room temperature, which exhibit a high field-effect mobility of 19.5 cm2 V− 1 s− 1, a small subthreshold swing of 160 mV/dec, a low threshold voltage of 0.1 V, a large on/off current ratio of 4.5 × 108, and superior negative and positive gate bias stabilities. 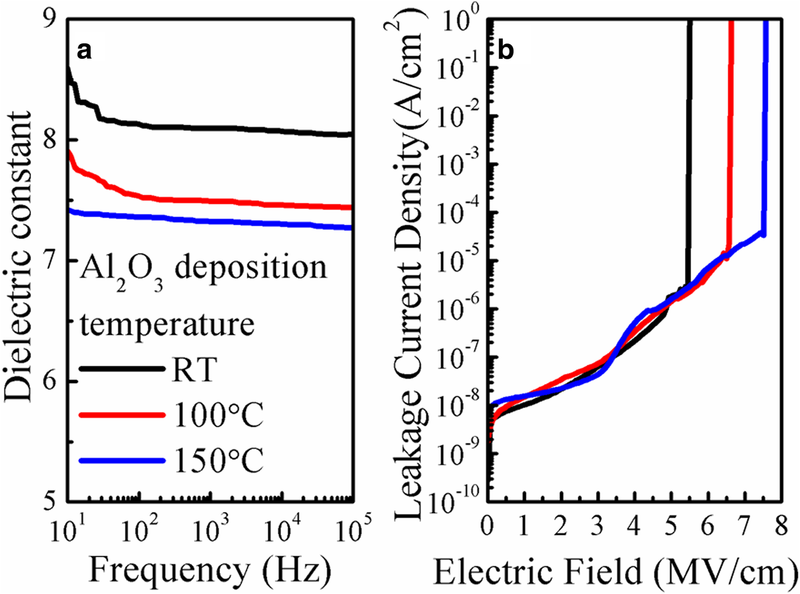 This is attributed to the hydrogen-rich Al2O3 dielectric deposited at room temperature in comparison with higher deposition temperatures, thus efficiently passivating the interfacial states of a-IGZO/Al2O3 and the oxygen vacancies and improving conductivity of the a-IGZO channel by generating additional electrons because of enhanced hydrogen doping during sputtering of IGZO. Such an extremely low thermal budget for high-performance a-IGZO TFTs is very attractive for flexible electronic application. Amorphous In-Ga-Zn-O (a-IGZO)-based thin film transistors (TFTs) have attracted much attention in the past decade due to their high mobility, good uniformity, high visible light transparency, and low process temperature [1, 2, 3]. These merits make it a promising candidate for the application of next-generation electronics, such as transparent display, flexible devices, or wearable electronics. In particular, for the applications of flexible electronics, TFTs are generally fabricated on low thermally stable polymer substrates. Thus, it is necessary to reduce the thermal budget of a-IGZO TFT fabrication. For this purpose, many researchers have focus on a-IGZO TFTs with room temperature fabricated gate insulators, such as sputtering [4, 5, 6], solution process [7, 8, 9], e-beam evaporation , and anodization . However, these dielectric films often suffer from high density of traps and strong dielectric/a-IGZO interfacial scattering, thus resulting in limited field-effect mobility, a large subthreshold swing, and a small on/off current ratio [4, 5, 6, 7, 8, 9, 10, 11]. 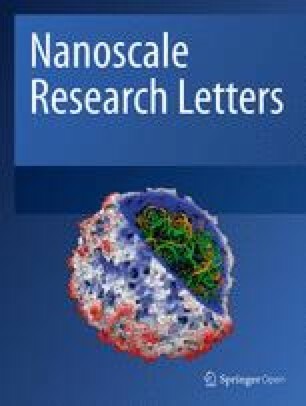 On the other hand, atomic layer deposition (ALD) is a promising technique, which can provide high-quality films, precise control of film thickness, good uniformity over a large area, and low process temperature [12, 13, 14]. Zheng et al. reported that the a-IGZO TFT with ALD SiO2 dielectric exhibited excellent electrical performance without the need of post-annealing. However, a high substrate temperature of 250 °C is required for the ALD of SiO2 films , which is higher than glass transition temperatures of most flexible plastic substrates. Interestingly, it is reported that ALD of Al2O3 films can be realized even at room temperature (RT) [16, 17]; meanwhile, the Al2O3 film deposited at RT contains a large amount of hydrogen (H) impurities . However, to the best of our knowledge, the abovementioned H-rich Al2O3 film has never been utilized as a gate insulator in a-IGZO TFT. Therefore, it is desirable to explore the a-IGZO TFT with a RT ALD Al2O3 gate insulator. In this letter, high-performance a-IGZO TFT was successfully fabricated with a room temperature deposited Al2O3 gate dielectric. 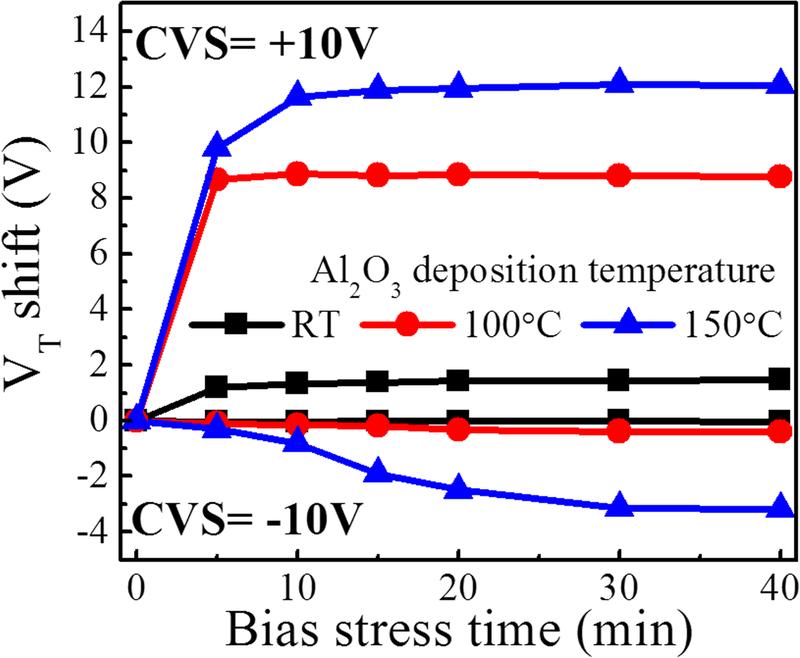 By comparing the characteristics of the a-IGZO TFTs with various Al2O3 gate insulators deposited at different temperatures, the underlying mechanism was addressed. Highly doped p-type silicon wafers (< 0.0015 Ω cm) were cleaned by standard RCA processes and served as gate electrodes. Forty-nanometer Al2O3 films were deposited in a commercial ALD system (Picsun Ltd.) using trimethylaluminum (TMA) and O2 plasma as a precursor and reactant, respectively. One growth cycle consisted of 0.1 s TMA pulse, 10 s N2 purge, 8 s O2 plasma pulse, and 10 s N2 purge. The TMA was maintained at 18 °C for a stable vapor pressure and dose, and the O2 gas flow rate was fixed at 150 sccm with a plasma generator power of 2500 W. Subsequently, 40-nm a-IGZO films were deposited by RF sputtering using an IGZO ceramic target with an atomic ratio of In:Ga:Zn:O = 1:1:1:4. During sputtering, working pressure and Ar and O2 gas flow rates were fixed at 0.88 Pa and 48 and 2 sccm, respectively. The active region was formed by photolithography and wet etching. After that, source/drain electrodes of 30-nm Ti/70-nm Au bilayers were prepared by electron beam evaporation and a lift-off method. No further annealing processes were applied on these devices. The electrical properties of a-IGZO TFTs were characterized using a semiconductor device analyzer (Agilent Tech B1500A) in a dark box at room temperature. The device stabilities were measured under positive and negative gate bias stresses, respectively. The depth profiles of elements and chemical composition were measured by secondary ion mass spectrometry (SIMS) and X-ray photoelectron spectroscopy (XPS), respectively. Figure 1a compares the dielectric constants of the Al2O3 films deposited at different temperatures as a function of frequency (i.e., from 10 Hz to 105 Hz). As the deposition temperature increases from 100 to 150 °C, the film shows a gradual decrease in dielectric constant. A similar trend was also reported in previous literatures for the deposition temperature changing from RT to 150 °C [18, 19]. This is because the RT Al2O3 film contains the highest concentration of hydrogen (H) in the form of OH groups. Thus, the corresponding dielectric constant is enhanced due to a rotation of more OH groups in an electric field . In terms of the measurement frequency of 10 Hz, the extracted dielectric constants for the RT, 100 °C, and 150 °C Al2O3 films are equal to 8.6, 7.9, and 7.4, respectively, which are used for the extraction of the field-effect mobility (μFE) and interfacial trap density (Dit) of the fabricated TFT device. Figure 1b shows the leakage current characteristics of different Al2O3 films. It is found that the RT Al2O3 film exhibits a small leakage current density of 2.38 × 10− 8 A/cm2 at 2 MV/cm and a breakdown electric field of 5.3 MV/cm. In addition, the breakdown electric field increases gradually with increasing deposition temperature from 100 to 150 °C. where e, k, T, and q represent the Euler’s number, Boltzmann constant, absolute temperature, and unit electron charge, respectively. Cox is the gate dielectric capacitance per unit area. For the RT Al2O3 TFT, the Dit is equal to 1.1 × 1012 eV− 1 cm− 2, which is over one or two times lower than those for the TFTs with the Al2O3 gate insulators deposited at 100 and 150 °C. The gate bias stabilities of the devices were further measured by applying negative and positive voltages. Figure 3 shows the VT shift as a function of bias stress time for different TFTs. In terms of negative gate bias stress (NGBS), the RT Al2O3 TFT exhibits a negligible VT shift of − 0.04 V after being stressed at − 10 V for 40 min. However, higher-temperature Al2O3 gate insulators generate larger VT shifts especially for 150 °C. Such a high NGBS stability for RT Al2O3 should be attributed to a low concentration of oxygen vacancies (VO) in the a-IGZO channel . With respect to positive gate bias stress (PGBS), the RT Al2O3 TFT shows a VT shift of 1.47 V, which is much smaller than those (8.8 V and 12.1 V) for the 100 and 150 °C Al2O3 TFTs. Moreover, the influence of storage time on the device performance was investigated, as shown in Fig. 4. Although no passivation layer is covered on the back channel, the device still maintains an excellent performance after being kept in a cabinet (20% RH) for 60 days at 30 °C; meanwhile, no significant variations in μFE and SS are observed. This indicates the RT Al2O3 TFTs without any passivation layer have good storage-time-dependent stability in the current ambience. Table 1 compares the performance of our RT Al2O3 TFT with other reports. It is found that our device exhibits a zero-near VT, smaller SS, and larger Ion/off in the case of comparable mobility [4, 23]. Although using a Ta2O5 gate insulator can obtain higher mobility of 61.5 cm2 V− 1 s− 1, both SS and Ion/off deteriorate remarkably . In a word, our RT Al2O3 TFT possesses a superior comprehensive performance in comparison with the 100 and 150 °C Al2O3 TFTs. Since all processing steps are identical except the deposition step of Al2O3, such significant differences in electrical performance should originate from the Al2O3 gate insulators. To understand the underlying mechanism, the depth profiles of the elements in the a-IGZO/Al2O3 stacked films were analyzed by SMIS. Figure 5a shows the dependence of H concentration on depth in the stacks of IGZO/Al2O3, where the Al2O3 films were deposited at RT and 150 °C, respectively. For comparison, an IGZO film deposited on a bare Si substrate was also analyzed. The IGZO film deposited on bare Si contains an H concentration of ~ 3 × 1021 cm− 3, which originates from the residual gas in sputtering system and absorbed H2/H2O molecules on the Si surface. Both IGZO films deposited on the Al2O3 films contain higher H concentrations than that on the bare Si substrate. This indicates that the increased H concentrations should come from the release of H impurities in the underlying Al2O3 films during sputtering of IGZO. Moreover, it is observed that the H concentration in the IGZO film atop the RT Al2O3 film is higher than that on the 150 °C one in the interface-near region, which can provide more efficient passivation of interfacial states. This thus improves the SS and PGBS stability of the RT Al2O3 TFT by reducing interfacial carrier trapping. Additionally, the O 1s XPS spectra of the a-IGZO films near the interface of IGZO/Al2O3 were analyzed, as shown in Fig. 5b. The fitted peaks are located at 530.2 ± 0.1 eV, 530.9 ± 0.1 eV, and 531.6 ± 0.1 eV, corresponding to O2− ions bound with metal (O1), VO (O2), and OH groups (O3), respectively [13, 24]. The percentage of O2 is 26.3% in the a-IGZO layer atop the bare Si; however, it decreases to 12.3% and 6.8% for the 150 °C and RT Al2O3 underlying films, respectively. This indicates that more VO in the IGZO channel can be effectively passivated by additional H impurities originating from the underlying Al2O3 films, especially for the RT Al2O3 film with a higher H concentration. It is reported that when VO and H both are present in the a-IGZO film, they can combine to form a stable state in which H is trapped at VO (VOH), and the resulting VOH is a shallow-level donor [25, 26, 27]. Thus, enhanced H doping into the IGZO channel atop the RT Al2O3 improves the channel conductivity by providing additional electrons. Furthermore, the small VT shift under the NGBS for the RT Al2O3 TFT can also be attributed to the effective H passivation of VO . As reported in literatures, the instability of TFT under NGBS originates from ionization of neutral VO (VO → VO2++2e−) [17, 29]. Moreover, the O3 percentage of the a-IGZO film on the RT Al2O3 is 6.9%, which is higher than those on the 150 °C Al2O3 (5.3%) and the bare Si (4.6%), respectively. The OH group could originate from the reaction O2− + H → OH− + e− during deposition of IGZO films . Thus, the enhanced H doping into the IGZO channel atop the RT Al2O3 film generates more OH groups and also contributes to improve the channel conductivity. A high-performance a-IGZO TFT was fabricated successfully under the extremely low thermal budget of RT using an H-rich Al2O3 gate dielectric prepared by O2 plasma-enhanced ALD. This is ascribed to the fact that the Al2O3 dielectric deposited at RT contains more hydrogen impurities than those deposited at higher temperatures. Thus, the released H impurities during sputtering of IGZO generated more electrons, and efficiently passivated the interfacial states of a-IGZO/Al2O3 and the VO in the a-IGZO channel. This work was supported by the National Natural Science Foundation of China (61874029, 61474027, 51603151), and the National Key Technologies R&D Program of China (2015ZX02102-003). YS and MNZ carried out the main part of the fabrication and analytical works. YS, XW, and SJD participated in the sequence alignment and drafted the manuscript. SJD and WJL conceived the study and participated in its design. All authors read and approved the final manuscript.